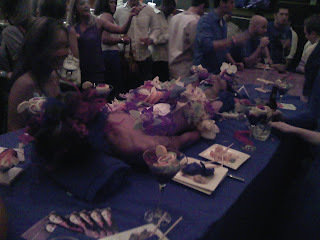 Last night I attended the VIP grand opening of Enso Asian Bistro and Sushi Bar at the EpiCentre. It was crowded from wall to wall, which is a lot for this large space. It was obvious that hundreds of people had gone online and printed tickets for the event as they could be seen holding them in their hands as the line stretched down the EpiCentre's courtyard (while Alive After Five was also taking place). I'm going to hold off doing a review on Enso for now. Opening nights at bars and restaurants, especially as crowded as this one was, don't always give you a genuine experience. Though the owners spared no expense on last night's event (free beer, wine, hors d'eouvres, and sushi was served) just like they didn't hold back on decking out the place. I expect this to be the new hotspot at the EpiCentre, and it might cipher away a little of Mez's crowd (Mez gets crowded on Thursday, Friday, and Saturday nights). If you visit Enso soon, post a comment here with your thoughts on it. 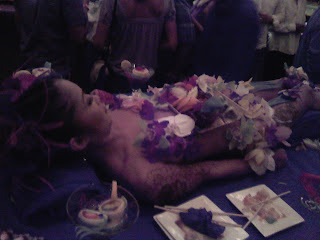 Here are a couple of pics I snapped with my camera phone of the nyotaimori model who was there, also known as naked sushi.